To the sound of the tango, Drs. Cynthia Bulik and Mae Lynn Reyes-Rodríguez travelled to Buenos Aires and Mar del Plata Argentina from November 3-10 to share with our Argentinian colleagues recent work being conducted at UNC on the genetics of eating disorders, couple-based therapy for anorexia nervosa (UCAN), binge eating disorder, and cultural adaptation of eating disorders treatments for Latinas (PAS Project). The invitation and sponsorship by “La Casita,” a center that specializes in the treatment of eating disorders, the “Private Center for Psychotherapy” in Buenos Aires, and Dr. Fabian Melamed of Mar del Plata, facilitated an open exchange of models of working with eating disorders with our Argentinian colleagues. In addition to a warm welcome, we encountered a group of colleagues and trainees who are facing the same challenges and concerns faced by all of us who are dedicated to the treatment of eating disorders. 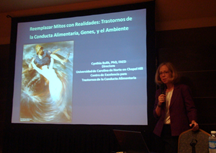 Our discussions underscored the need to include Latin American samples in our genetic studies of anorexia nervosa, which to date have been limited to individuals of European ancestry (and one Japanese study). They also reaffirmed the necessity of including family members in the treatment for eating disorders in the Argentine population, consistent with the work we are conducting in PAS Project. The most salient challenges raised were working with comorbidities, the treatment of obesity, treatment costs, and limitations of specialist services across levels of care—especially inpatient services. Complementing our experience, we attended the presentation of the play “Gordas” (Fat) starring Natalia Marcet and directed by Anne Woolf, which portrays the emotional battle of a woman suffering from bulimia nervosa. From the perspective of a recovered patient, the piece deals with the impact of constant teasing about appearance, and the endless race between obsession and lack of control faced by patients who are trying to lose weight, which becomes “the delicious normalcy.” The work was declared to be of cultural interest by the Ministry of Culture and is being used as a resource for prevention in schools. The staging of the play is a perfect representation of the use of cultural elements to broach subjects that may be stigmatizing and difficult to approach. In another cultural extension, it was interesting to attend a milonga. We learned that, more than just a dance, the tango signifies an entire interpersonal dynamic of courtship between a man and a woman, in which the body and its movement plays a central role. Finally, we hope that this experience will open new avenues for collaborative work with Latin American countries that will allow us to produce better models of understanding of eating disorders in diverse populations.